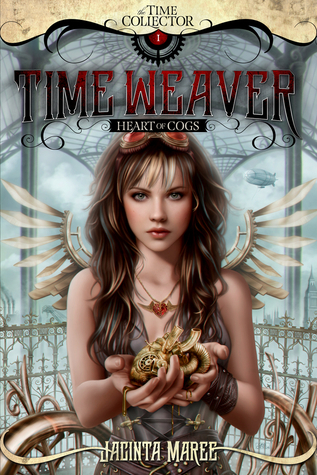 Hello beautiful bookworms, and welcome to my Time Weaver: Heart of Cogs blog stop! Today I’m sharing with you an excerpt from this steampunk novel. To read some reviews, interviews, and guest posts for this book, please do visit the other blogs in this blog tour! You can find them here. Tightness gripped her, reeling Elizabeth backwards. As with each visit, the clock in her head started its count down. Don’t let it be today. Please, not today. With a gulp, she peered out the window where, from their second-story drop, she could see Arthur Beaumontt step out of his car. Anxiety bubbled. Oh, please, not today. Arthur Beaumontt lurked around the corridors of her school just as often as her nightmares. It became so frequent she didn’t know which one was the reality. At this moment, it didn’t matter. He was here. The girl gave her a one-shouldered shrug. “Looks like you’ll be getting that rope necklace sooner than you thought.” She turned and walked off with the rest of the girls in tow. Elizabeth pulled back from the window in fear of Arthur looking up and spotting her, plagued by the thought of her hanging, neck cracked, from the ceiling. Belonging to the Academy of underprivileged ladies had saved her from the streets and brothels, but had perhaps also delivered her to a far worse evil. An evil called Arthur Beaumontt. “Sorry, mistress.” Sweat teased Elizabeth’s hair, sleeking white loose strands to the curve of her neck. The clock kept ticking down, always aware that her life could change at any devastating moment. She hoisted the bucket higher and fleeted down the hall. In a week, she would turn eighteen, and as school policies dictated, she would be sold to one of the noble houses. A personal maid, a thing, a piece of property, to a wealthy household. Being trained for a life of servitude swelled her ankles, burnt her fingers, and pulled her muscles to exhaustion. But she would never complain as the alternative was a reality best ignored. The Beaumontts were the power among the nobles, and it was seen as improper to buy anything the Beaumontts wanted. So, if Arthur wanted her, he was going to get her. End of story. Elizabeth disappeared down the corridors with her fellow students, becoming a single blotch of pale blue among the sea of identical dresses. From behind, a hand spun her around. She should’ve known it was him the moment he touched her. His hot hands were always sweaty. “Why is it every time I see you, you seem to only get uglier?” A smirk curdled his mouth. Arthur Beaumontt, a boy dressed in his father’s wealth, chuckled without any hint of joy. He always said such things. Called her ugly. Worthless. Unwanted. Behind her back, she could hear the hallways emptying, the rest of the girls sheltering behind closed doors. Thank you so much for being a part of the tour!! I really, really appreciate it.